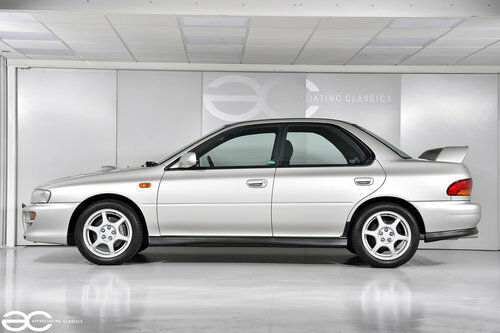 Here we have a ‘as new’ Subaru Impreza Turbo 2000, having been garaged from new and only used very sparingly in good weather, having covered only 3,808 miles from new, this car is a credit to its only owner from new. 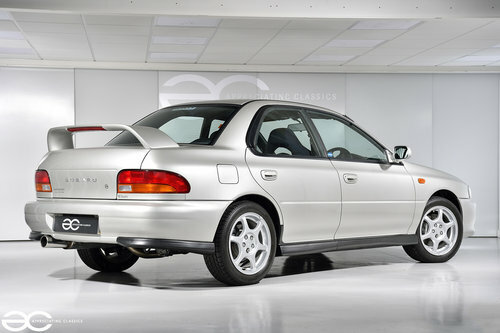 An unmolested original Impreza UK Turbo 2000 in this condition, with such low mileage and owners is unheard of, and when compared with the values of an equivalent RB5, P1, or 22B, this can only be considered somewhat of a bargain, and more than worthy of any collection. Purchased new by Mr Newitt, on the 5th of June 2000, the original invoice shows that Mr Newitt opted for the following options when ordering the vehicle. Air conditioning, 6 stack CD changer, haedlamp & fog lamp covers, and floor mats. 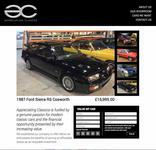 A total price of £22,687.74 is shown on the original invoice. Also within the vast history file, is of course, the original immaculate Subaru wallet, with all original booklets, leaflets, and business cards. The spare key is still present, which looks to have never been used, and both keys still have the supplying dealer key rings. The service booklet shows that the vehicle has been serviced by the supplying Subaru dealership 13 times, with supporting invoices for all but two of the service stamps. We will be having a full service carried out (including cambelt) by our local Subaru dealership as well. 14 – Cambelt service, none Subaru dealership – invoice only. 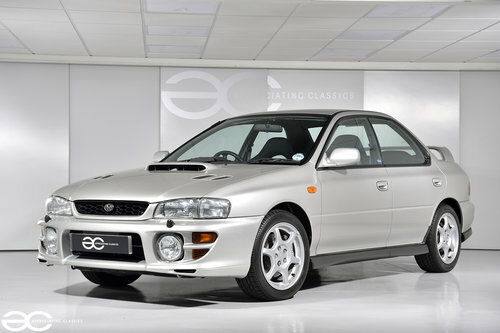 18 – Full service to be carried out by Subaru dealership to maintain Subaru stamped history. 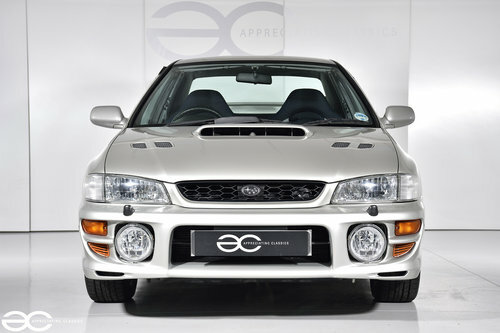 Also within the file are invoices from Subaru for a brand new Prodrive exhaust being fitted which was a dealer brochure option. This vehicle should really be seen to be appreciated, it is clear to see that this has been the absolute pride and joy of the single owner from new. Having measured the paintwork using a paint depth gauge, we can confirm that the paintwork is all original and in superb condition across the entirety of the car. All original badges are still in place, and are in great condition. Also the car has had Subaru headlight and fog light covers from new, so these lights are perfect and crystal clear. Of course, the supplying dealership number plates and rear window sticker are still in place as well. All plastic trim is still as new, with none of the usual fading or damage as is so often the case. Even the wheels still have the original tyres and wheel weights in place, and are of course unmarked. 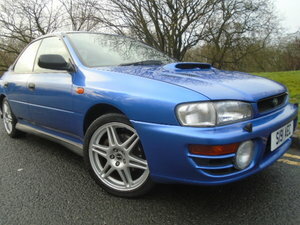 As per the exterior of this Subaru Impreza, the interior is in stunning condition. Zero modifications have been carried out to the car, and the interior is as new. The original steering wheel, gear knob, foot pedal rubbers and seats are all without any signs of any wear. All switchgear works just as it should do, and of course all switchgear is without any signs of wear. The rear seats have never carried passengers, and this is clear to see. No discolouration to any trim, and no damage is present on any of the kickplates or trims. The boot area is immaculate, including the Subaru luggage mat, and the spare wheel, tool kit and original jack are all still in place unmarked. Of course, the engine bay presents fantastically well. 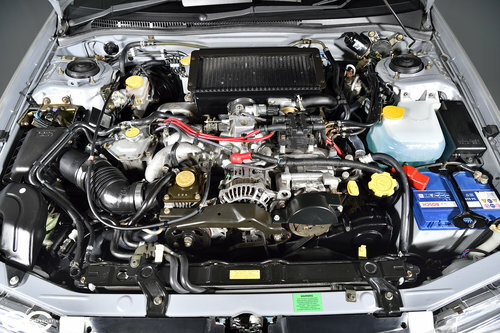 Anybody familiar with this era of Japanese vehicles, will know that the brackets, bolts, and clips usually corrode over time, but this engine bay still looks extremely fresh. All brackets and clips still have the original zinc finish and look great. The original intercooler is still in great condition, all original hoses and leads present very well. This is certainly an engine bay you would be proud to show off at any car show. Turn the key and the engine fires into life without hesitation, giving that legendary Subaru rumble with the optional upgrade Prodrive exhasut. With 215bhp, these cars were a great value performance car when new, and still give ample performance today. No unwanted noises, and no smoking at all from this example. You can relax knowing that a full service has been carried out by Subaru ready for the lucky new owner. All running gear is in superb condition. The wheels are still in original finish, with original tyres and wheel weights still in place. The suspension is all original and not only performs faultlessly, but it presents very well indeed. Inspecting the underside of the car, it is clear that the car has not been used in bad weather, and has been stored in a dry garage its entire life. Braking is still impressive today, with strong and straight performance, and the handling is still very impressive all these years later. As with most Subaru’s, the gear change is lovely and precise, and the clutch is a pleasure to operate.